NATIONAL Under-16 coach Lim Teong Kim blamed the referee for the 4-2 defeat to Thailand in today�s AFC Championship Group A match at the National Stadium in Bukit Jalil. The former Bayern Munich youth assistant coach deemed striker Luqman Hakim Shamsudin�s sending off in the 51st minute by referee Omar Mohamed Ahmed Hassan as an unfair decision. The score was locked at 2-2 then. The result had put Malaysia�s chances of qualifying for next year�s Under-17 World Cup in jeopardy as they must now beat two-time champions Japan on Wednesday to qualify for the second stage. Failure to achieve their target of finishing top four for a Under-17 World Cup spot will prove disastrous as the team, groomed under the National Football Development Programme (NFDP) since 2015, were exposed in several international tournaments prior to the AFC event. "The referee killed us after we levelled the game 2-2. It was clearly not a red card," said a furious Teong Kim at the post-match press conference today. "You can see it clearly in the video replay. He (Luqman) was looking at the ball and did not see the opponent, it is a normal move in football. "I don't agree with it and it affected our game. It is not easy to play when you are a man down but this is football". โค้ช เตียงคิม กล่าวด้วยอารมณ์ใน press con หลังเกมว่า "กรรมการส่งเราสู่ความพายแพ้หลังจากเราตีเสมอ 2-2 ได้ อย่างไรเหตุการณ์นั้นมันก็ไม่ใช่ใบแดงอย่างแน่นอน"
The result sees Malaysia remaining with three points in the competition, thanks to their 6-2 win over Tajikistan on Thursday. For Thailand, it was their first win following the 5-2 defeat to Japan. "The first goal was a gift from my players, maybe it was a birthday gift or a Hari Raya gift. Thailand should thank my players,� added Teong Kim. "I was proud that they managed to level the match 2-2 but the red card held us back. ลิมเตียงคิมกล่าวว่า "ประตูแรกที่เราเสียนี่เหมือนเราส่งของขวัญให้ทีมไทยเลย บางทีมันอาจจะเป็นของขวัญวันเกิดหรือของขวัญวัน ฮายีรายอ เลยก็ได้ ทีมไทยต้องมาขอบคุณเด็กผมเลยนะ"
Thailand coach Thongchai Rungreangleas admitted that Malaysia�s red card was a blessing to his team. "Our tactics today was better than it was against Japan. 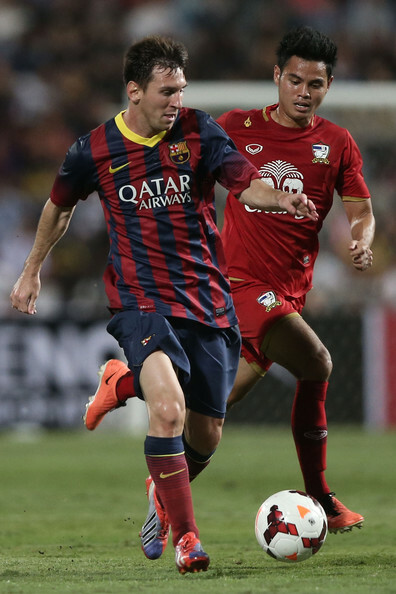 Our midfield functioned well and created chances for us to score," said Thongchai. "Malaysia played well in the first half. Only after the red card were we able to control the game and achieve the win." He is now optimistic of his squad�s chances of progressing to the last-eight of the competition. They only need to beat Tajikistan in their final group game on Wednesday to qualify for the quarter-finals. "We have a good chance. What we need to do now is focus on Tajikistan and take things one match at a time,� added Thongchai. "Our goal is to reach the quarterfinals and we can achieve it."